Last night I ran a stall at the Prosecco and Shopping evening, the first stall of the season for me. 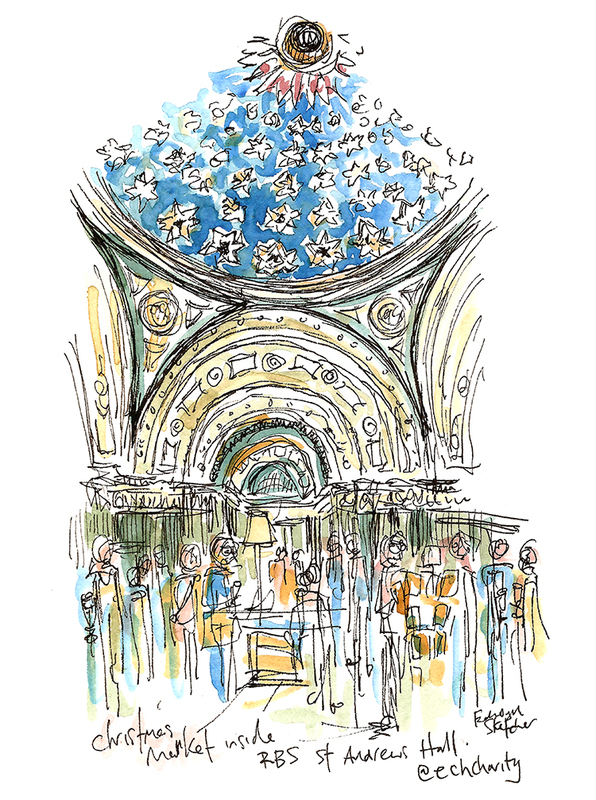 The stunning dome roofed hall inside the Royal Bank of Scotland building at St Andrews Square has a wonderful ceiling of stars, which my sketch above (drawn from my stall) shows a small part of. The room is magnificent and well worth a visit if you are passing, the bank is open six days a week. Edinburgh Children’s Hospital Charity (formerly known as The Sick Kids Friends Foundation) had organised the event and it was very well organised with prosecco and canapes handed out to shoppers as they made their around the many varied seasonal stalls. I had chance near the end of the evening to sketch and visit a couple of stalls, namely the inspiring Glass Art of Mary W Drummond, and Halidon Home (my neighbouring stall) who had a delightful mix of home furnishings and original Christmas decorations, I will be popping in to their Dundas street shop to see more soon. My sketch was made on location using a black fine liner and water brush, on an A5 sketchpad.